Southeastern Turkey has now become a jurisdiction for terrorism finance, weapons smuggling, illegal oil sales, and the flow of fighters to Syria. This pipeline serves the interest of several terrorist organizations, including Jabhat al-Nusra (JN) and the Islamic State (IS). It is unclear whether Ankara is explicitly assisting these groups, or whether JN and IS are merely exploiting Turkey's lax border policies. Either way, it is clear that Turkey seeks to bring down the regime of Bashar al-Assad in Syria with the aid of irregular fighters. Ankara opened its border to Syrian rebel forces, namely the Free Syrian Army, in the early stages of the uprising in 2011. But when Assad did not fall, the makeup of the Syrian opposition began to change. Radical groups such as the al-Qaeda-affiliated Jabhat al-Nusra and the Salafist Ahrar al-Sham emerged in 2012. Within a year, jihadist groups dominated the Syrian opposition. Border towns in southeastern Turkey were effectively a rear guard for some of the rebel units, while foreign fighters streamed into Syria from Turkey. All of this served as a crucible for the rise of the Islamic State. The meteoric ascendance of IS has led to a full-blown crisis in Iraq and Syria. After conquering large swaths of territory in both states, IS declared a caliphate. The group's brutality, highlighted by the beheadings of journalists, has prompted the United States and a broad coalition of Arab States to intervene with military force. The IS crisis has put Turkey and the U.S. on a collision course. Turkey refuses to allow the coalition to launch military strikes from its soil. Its military also merely looked on while IS besieged the Kurdish town of Kobani, just across its border. Turkey negotiated directly with IS in the summer of 2013 to release 49 Turks held by the terrorist group. In return, Ankara reportedly secured the release of 180 IS fighters, many of whom returned to the battlefield. Meanwhile, the border continues to serve as a transit point for the illegal sale of oil, the transfer of weapons, and the flow of foreign fighters. Inside Turkey, IS has also established cells for recruiting militants and other logistical operations. All of this has raised questions about Turkey's value as an American ally, and its place in the NATO alliance. Turkey's Syria policy also has negative repercussions domestically. The presence of extremists threatens Turkey's internal security, as well as its economic stability, given Ankara's dependence on foreign investment and tourism. Additionally, the turmoil in Syria has greatly complicated Turkey's relationships with the Kurds and exacerbated the government's battles with domestic opponents. Washington now needs to work with Ankara to address the extremism problem on its southeastern front. This will require high-level diplomatic engagement that must address head-on the security challenges that Turkey has helped spawn. However, Washington must also address Turkey's valid concerns, including long-term strategies for ending the Assad regime and how to increase support for the moderate opposition in Syria. The United States also has an opportunity to work with its NATO allies to help Ankara erect an integrated border protection system along the Syrian border to contain the current security and illicit finance threats. If Ankara is unwilling to tackle these challenges, Washington may need to consider other measures, including sanctions or curbing the security cooperation that has long been a cornerstone of this important bilateral relationship. As the U.S. leads coalition air strikes on the Islamic State (IS) in Syria and Iraq, tensions are boiling between Turkey and Washington. On October 2, 2014, Vice President Joe Biden made headlines after he publicly stated that Turkish President Recep Tayyip Erdoğan admitted Turkey's role in helping IS grow. Recalling a phone conversation he had with President Erdoğan, Biden told reporters that Erdoğan said, "You were right. We let too many people through," referring to Turkey's loose border policies that allowed foreign fighters to cross into Syria and join extremist groups. Erdoğan, however, rejected any such admission and demanded an apology. Biden called Erdoğan two days after the incident and apologized. But the issue was far from settled. Less than two weeks later, Kemal Kılıçdaroğlu, the leader of Turkey's main opposition party, the People's Republican Party (CHP), accused Erdoğan's Justice and Development Party (AKP) of providing weapons to terrorist groups in Syria, including IS. Kılıçdaroğlu cited documents from a prosecutor in the southern Turkish city of Adana, along with testimonies by two Turkish truck drivers, pointing to direct Turkish government involvement. More broadly, concerns among NATO and Western states are mounting. Though Ankara has taken in more than its fair share of refugees (1.5 million as of November 2014) and it has agreed to help the anti-IS coalition in limited ways, Turkey is simply not a reliable ally in the fight against the jihadists in Syria. Turkey has refused to take part in the U.S.-led military operations, even though IS is on its border. And while this reticence is linked to ambivalence about coming to the aid of Kurds, and the insistence that the fall of Assad is the only acceptable outcome in the Syria conflict, Turkey appears to have contributed to the rise of extremism in Syria. Multiple reports suggest that extremists of all stripes have exploited Turkey's porous border with Syria over the last several years, and now IS is reaping the benefits. There now appears to be IS cells active inside Turkey's border. Turkey has also cut at least one prisoner swap deal with IS that resulted in the release of militants who returned to the front. Turkey's southeastern frontier is a transit point for fighters, weapons, cash, and more. Turkey clearly has an IS problem, but some aspects of it are difficult to discern. Some of the reporting derives from sources that have an ax to grind with Ankara. Turkey insists that many of the allegations, particularly those that originate from sources within anti-Turkish Kurdish movements or the stridently anti-AKP Fethullah Gülen movement, amount to information warfare. Yet, reports from other sources — mainstream U.S. and Turkish media — suggest that the charges against Turkey should be taken seriously. At the very least, they prompt a number of troubling questions. Does Ankara view IS as a necessary evil to bring down the regime of Bashar al-Assad in Syria? If so, did the AKP willingly allow one of the world's most dangerous terrorist movements to establish nodes of operation inside Turkey and along its southeastern border with the goal of defeating Assad? 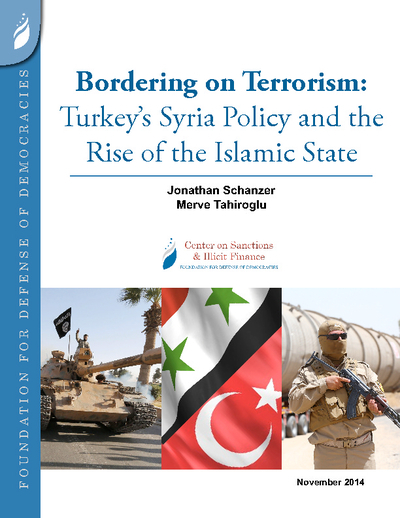 Did Ankara allow for IS to move people, weapons, cash, and other goods across Turkey's 565-mile border with Syria, or has the terrorist movement simply exploited the relatively weak central authority that has long characterized Turkey's southeastern front? We may never arrive at the answers to these questions. Or there may be more than one answer to some of them. But one thing does appear clear. Ankara's initial policy of seeking to bring down Assad in the early months of the Syrian uprising in 2011, likely with the hope of installing a regime that would be a natural ally or proxy to the AKP, has led to a chain of errant decisions that ultimately contributed to the rise to IS. Ankara initially opened the border to militants seeking to fight Assad's forces. When Assad did not fall, and Washington refused to enforce its so-called "red line" of responding to chemical weapons attacks by the Assad regime against its own people, the challenges mounted. Increasingly radical forces began to stream into Syria, and some of them established cells of operation within Turkey itself. It's unclear exactly when the AKP lost control, but it was well before the Islamic State surged in prominence and power among the Syrian opposition groups in mid-2014, leaving Turkey in the decidedly awkward position it is in today. Turkey must accept responsibility for its role in this crisis. Specifically, it must take steps to address the illicit financial channels and logistical pipelines in Turkey that terrorist groups are now exploiting with ease. However, Turkey is not alone to blame. Washington's Syria policy has consistently failed to address the core challenge of removing Bashar al-Assad, whose mass slaughter of Syrians continues with impunity. Washington has also failed to confront Turkey over its dangerous border policies that led inexorably to the IS crisis. Southeastern Turkey is now, without question, the most important jurisdiction for the financing, arming, and manning of the radical movements fighting in Syria. Washington must work with Ankara to stop this, even if the AKP remains ambivalent about what needs to be done. Ties between Turkey and Syria have historically been uneasy. One source of discord is a territorial dispute regarding Turkey's Hatay province. The territory changed hands between the Ottoman Empire and Syria before finally coming under Turkish rule in 1939, almost 20 years after the establishment of the modern Turkish Republic. Turkey's subsequent dam projects across the southeastern towns, many built during the 1960s, threatened Syria's water security. This, coupled with Turkey's Western leanings, prompted Damascus to adopt a Kurdish policy that has antagonized Turkey over the years. Syria harbored militant groups that targeted Turkey, such as the Secret Army for the Liberation of Armenia (ASLA) and the Kurdistan Workers' Party (PKK). Syria offered the PKK safe haven to organize and train, while its top leader Abdullah Öcalan (now imprisoned in Turkey) lived in Damascus for nearly two decades, between 1979 and 1998. Ties between Ankara and Damascus soured further as Turkish-Israeli relations blossomed during the Palestinian-Israeli peace process of the 1990s. But after the collapse of the peace process in 2000, and after Syria expelled Öcalan in 1998, relations between Ankara and Damascus began to improve significantly, even leading to a military training agreement in 2002. Under the leadership of the AKP, which came to power in November 2002, Turkey strived for closer political and economic relations with all of its neighbors. This was a policy later articulated by Prime Minister (then-Foreign Minister) Ahmet Davutoğlu called "Zero problems with neighbors." The policy drew Turkey and Syria even closer together in the late 2000s, with a free-trade agreement in 2007, and then-Prime Minister Erdoğan going so far as to call Syrian dictator Bashar al-Assad his "brother" in 2009. The Arab Spring-style uprising against Assad, which began in March 2011, dissolved this dynamic. Turkey initially called on Assad to implement reforms and refrain from using violence to quell the mounting opposition. Erdoğan even offered to work with the Syrian strongman. By August 2011, however, it was clear that Assad was neither interested in reform nor nonviolence. With a slaughter in the making, Turkey quickly committed itself to regime change in Syria. Erdoğan, who reportedly felt personally snubbed by the Syria leader, called for Assad to step down on November 22, 2011. By 2012, it was clear that Turkey was actively supporting the Syrian opposition. Several factors explain Turkey's policy of backing the Syrian opposition. First, Turkey assessed that the regime was on the verge of collapse. This was not hard to fathom, given that similar Arab Spring uprisings erupted in Egypt, Tunisia, and Libya, bringing down dictators who had been in power for roughly three decades apiece. It was therefore logical that Turkey sought to have a say in the future leadership of a neighboring country, particularly given its history with Syria. But Turkey's calculus was also driven by sectarianism and regional ambitions. Though Ankara clearly endeavored to maintain its "zero problems" policy by trying to work with Assad during the early months of the uprising, the Sunni-dominated AKP also shared a natural kinship with the largely Sunni Syrian opposition, which opposed the Assad regime for political reasons, but also strove to topple the minority Alawite regime, backed by Shi'ite Iran. As the situation in Syria deteriorated, Turkey saw an opportunity to help install a Sunni regime—one that might even be influenced by its own Muslim Brotherhood doctrine. As one AKP deputy explained, the goal was "the establishment of a Turkey-friendly government in Damascus and an intensification of economic ties." Syria, however, was but one piece of the puzzle for the AKP. The leadership in Ankara already viewed the rise of the Brotherhood in Egypt and Tunisia as an opportunity to establish Turkey as the leader of an emerging, democratically elected Sunni order that appeared to be coalescing in the Middle East. The AKP viewed Turkey as the ideal Muslim democracy in the region, and thus sought to export the "Turkish Model" to the Arab Spring nations in hopes to become their moral leader. To this end, Davutoğlu boasted to the Turkish parliament in July 2012 that Turkey would be "the owner, pioneer, and the servant of this new Middle East." The AKP's vision for an Islamist order was not exactly new. It is a vision commonly embraced by the Muslim Brotherhood across the region. And it is no secret that many of the AKP's founders, including President Erdoğan and former President Abdullah Gül, came from the Milli Görüş, the National Vision movement led by Turkey's main political-Islamist figure Necmettin Erbakan, which was deeply influenced by the Muslim Brotherhood. The Assad regime, by contrast, had a longstanding antagonistic relationship with the Muslim Brotherhood. The secular Baathist regime banned the group's activities in 1964. At the time, tensions between dictatorial regimes and the ideologically charged Brotherhood were common across the region. In Syria, those tensions boiled over in 1980, when the Brotherhood unsuccessfully attempted to assassinate President Hafez al-Assad (Bashar's father) on June 26. The Muslim Brotherhood was finally exiled from Syria in 1982 after Assad launched a large-scale military operation in Hama, Syria's third largest city, killing an estimated 25,000 people. Beaten into submission, the Brotherhood was largely quiescent in Syria for the two decades that followed. Many of the movement's members found haven elsewhere around the region. Perhaps the only notable exception was the increased presence of the Palestinian terrorist group Hamas, a splinter faction of the Muslim Brotherhood, in the 1990s. But this relationship did not revolve around Syrian politics. Rather, it was forged on Iran's patronage and a mutual disdain for Israel. When ties began to improve between Damascus and Ankara in the year 2000, Turkey sought to encourage reconciliation between Damascus and the Brotherhood. This was made somewhat easier by the change in leadership in both countries; Bashar ascended in July 2000 and the AKP rose to power in November 2002. The AKP's efforts were not fruitful, however. Notably, Turkey's efforts in 2009 to mediate a resolution between the regime and the Brotherhood came to naught. Under the AKP, however, Turkey continued its efforts to rehabilitate the Syrian Brotherhood. In July 2010, for example, Turkey allowed the General Committee of the Muslim Brotherhood to hold a meeting in Istanbul, where the group elected its new leader. This new leader publicly expressed his gratitude to the AKP in October 2010, saying, "We favor Turkish intervention to resolve differences [with the Syrian regime]." When the Syrian uprising began in March 2011, the Brotherhood was largely a nonfactor. It was the Free Syrian Army (FSA) that first emerged to defend protestors from assaults by Assad regime forces. By September or October, the FSA evolved into fighting units in order to ambush the Syrian army units. Turkey worked to help the FSA and other opposition groups in the early phases of the conflict. In October 2011, for example, Turkey facilitated the establishment of the Syrian National Council (SNC) in Istanbul. It was an effort to bring together the disparate Syrian opposition factions under an umbrella that would garner assistance from the West. Amidst mounting frustration, Istanbul hosted a March 2012 "Friends of Syria" meeting, where Turkey and the U.S. pledged to set up a framework for further humanitarian and technical aid to be sent to the opposition. It soon became clear that Turkey was empowering Syria's Muslim Brotherhood through these initiatives. For example, the SNC brought together a mix of several factions of the Syrian opposition, but it was clearly dominated by the Syrian Muslim Brotherhood. This was not lost on the other opposition factions. In a May 2012 meeting at the State Department, Syrian-Kurdish officials complained that the Syrian Muslim Brotherhood, with the support of Turkey, had dominated the newly formed SNC. "Turkey's vision for Syria was a centralized 'Islamist government' backed by a constitution," according one official. Similarly, in December 2012, when Turkey hosted the Syrian opposition in the city of Antalya and the new command structure of the Free Syrian Army (FSA) was announced, roughly two-thirds were estimated to be from the Muslim Brotherhood. Regional politics were such that the Obama administration was not inclined to challenge Turkey. At the time, the Muslim Brotherhood was riding high from the Arab Spring. Amidst the collapse of regimes in Egypt and Tunisia, the rise of the Islamist faction was seen in the West as unstoppable. And it was for this reason that U.S. President Barack Obama relied heavily on Turkey, America's longstanding ally and purported leader of the Muslim Brotherhood movement, to manage what was widely believed to be the inevitable demise of Assad and the rise of yet another Muslim Brotherhood government in the Middle East. But Assad did not fall. Turkey soon engaged in clandestine efforts to provide additional, covert support to the opposition. According to U.S. officials cited in The Wall Street Journal, Hakan Fidan, the head of Turkey's intelligence organization (MIT), directed Ankara's efforts to bolster elements of the Syrian opposition — directly and indirectly — through the provision of weapons, money, and logistical support, starting in early 2012. The Journal noted that, "the MIT acted like a 'traffic cop' that arranged weapons drops and let convoys through checkpoints along Turkey's 565-mile border with Syria." As one former senior U.S. official noted, "as 2012 went on, the Turks became more and more involved in helping FSA units get equipment and money…Turkey was supporting both religious and secular units." To some extent, the Turkish strategy appeared to be paying dividends. It allowed for the opposition fighters to gain strength and advance in Syrian territories along the Turkish border. In July 2012, for example, the FSA took control of two border crossings with Syria, the Bab al-Hawa crossing bordering Hatay, and the Jarablus crossing bordering Gaziantep. By the end of the year, the opposition was making gains on the Assad regime in Tel Abyad, across from Şanlıurfa. However, by mid-2012, several extremist groups were discernible among the opposition patchwork. Though these groups were small at first, they rapidly became some of the most effective fighting forces. Jabhat al-Nusra (JN), for example, emerged as one of the more lethal groups fighting in Syria in January 2012. By December 2012, the U.S. State Department designated JN as a terrorist organization because of its stated links to al-Qaeda. By the time it was designated, JN had consolidated its presence across most Syrian governorates. By early 2013, it established a strong presence in Aleppo, Idlib, Deir Ezzor, and Deraa. Ahrar al-Sham, another extremist group, announced its official formation in January 2012. Through small-arms ambushes and IED attacks, it quickly established itself as a prominent actor in the insurgency. By December 2012, Ahrar al-Sham, along with 10 other militant Islamist groups established a coalition called the Syrian Islamic Front. The Front's leaders were mostly made up of members from Ahrar al-Sham. In February 2013, Ahrar al-Sham merged again with three other factions and renamed itself Harakat Ahrar al-Sham al-Islamiyya. This faction worked with some U.S.-supported groups, but also extremists like JN. In November 2013, Ahrar al-Sham joined forces with other Islamist fighting factions, such as Liwaa' al-Tawhid, Jaysh al-Islam, and Suqour al-Sham. This grouping was known as the Islamic Front. These rebel groups, along with nearly every other faction fighting in Syria, benefited from Turkey's permissive border policies. Indeed, without access to the border, the Syrian revolution would have ceased to exist. This was undoubtedly why Turkey kept the border open. But, as a former senior U.S. government official notes, in October and November 2012, FSA figures were reporting to Washington that jihadists were crossing back and forth, while Turkish border guards simply looked the other way. "The Turks, I don't think, ever tried to control their border," the former official said. "They more or less let all kinds of people in—Nusra was some of them, some of them were secularists, Islamist, non-al-Qaeda groups... They weren't singling out any group to favor, it was more of a laissez faire approach." By May 2013, U.S. officials were clearly concerned. President Obama met with then-Prime Minister Erdoğan in Washington and told him that the U.S. believed, "Turkey was letting arms and fighters flow into Syria indiscriminately and sometimes to the wrong rebels, including anti-Western jihadists." Officials involved in the internal discussions reportedly communicated to Ankara "the need to more tightly control the arms flow." The Turks abided by certain commitments, even as they broke others. For example, they appear to have respected the administration's concerns about allowing shoulder-launched anti-aircraft missiles to cross the border. It is worth noting that most of the arms were not Turkish arms. As the former senior U.S. government official noted, "the Qataris provided much more arms than the Turks did—but the Turks and Qataris were channeling a lot of this to Islamist groups." By September 2013, Jabhat al-Nusra was said to have 7,000 to 8,000 militants fighting in Syria. Approximately one-quarter of these fighters were foreign jihadists, who reportedly crossed into Syria from Turkey. By December 2013, JN and other extremist groups had gained even more ground in Syria. This coincided with the weakening of the FSA. The alarm over these extremists groups was such that the U.S. and the UK announced a suspension of certain aid to the Syrian opposition (which later resumed). Meanwhile, journalists covering the Syrian civil war from the Turkish southeastern frontier were reporting with increasing frequency about how jihadism was becoming more common within the fighting factions. Moreover, Turkey appeared to be playing a role similar to that of Pakistan, which enabled jihadi factions like the Taliban. As Norwegian terrorism expert Thomas Heghammer noted in December of 2013, "Turkey is to Syria now what Pakistan was to Afghanistan in the 1990s. Antakya is the Peshawar of Syria. Turkey is the main passageway for fighters from the West, and from the rest of the region." The jihadi factions were receiving support through such Turkish border areas as Hatay, Kilis, Gaziantep, and Şanlıurfa. The proximity of these towns to the front made it convenient to serve as logistical bases, so that weapons and fighters could cross easily, so long as Ankara allowed for it. "Without using the Turkish town of Ceylanpınar as a rear base," Turkish journalist Kadri Gürsel wrote in September 2013. "Jabhat al-Nusra could not have fought the Kurds for months in Ras al-Ain, right on the other side of the border." Syrian and Turkish Kurds have voiced the most concerns about Turkey's aid to Jabhat al-Nusra and other extremist groups. The Syrian Kurdish Democratic Union Party (PYD), which declared an autonomous area in Syria after the uprising began, was among the more outspoken Kurdish factions in this regard. But the PYD is the Syrian wing of the Kurdish Worker's Party (PKK), which has been designated by Turkey, the EU, and the U.S. as a terrorist organization. Their allegations have therefore been easy for Ankara to dismiss. Yet the PYD was not alone. The Kurdish National Council (KNC), a separate coalition of Syrian Kurds that Turkey politically supported against the PYD, also charged that Turkey has been backing the jihadists. In a meeting in December 2012, one KNC official told U.S. Ambassador to Syria Robert Ford, "The extremists in the opposition are getting support from governments, such as Turkey." By 2014, former U.S. officials began to echo Kurdish claims. In September 2014, Francis Ricciardone, the former U.S. ambassador to Turkey, made headlines when he stated that Turkey "worked with groups for a period, including al-Nusra, whom we finally designated as we're not willing to work with." He said that Turkey intended to cooperate with the Islamist groups, while at the same time trying to moderate them. The following month, Ford (who had since resigned his post) revealed that he "spoke with Turkish officials many times about the flow of jihadists into Syria through Turkish territory." It should be noted that JN, while designated by the U.S. in December 2012, was only designated by the United Nations in May 2013. In other words, Turkey was not required by its own laws to take action against JN until the UN Security Council did. But it is also important to note that Ankara did not officially designate JN for more than one year after the UN decision, on June 3, 2014. Indeed, Turkey was rather unambiguous about its views of JN. In an interview a few days after the UN ban in May 2013, Foreign Minister Ahmet Davutoğlu told reporters that while Ankara acknowledged the connections to al-Qaeda, "Jabhat al-Nusra is the result of the quagmire there… declaring them a terrorist organization has resulted in more harm than good." A former senior U.S. official recalls that Ankara "didn't argue with the [al-Qaeda] affiliation, but they said it was a very regrettable decision. They said it will a) help their recruiting, which you shouldn't want, and b) it is going to complicate the relationship with the broader opposition. Both of those are true. Nusra absolutely did get a boost of credibility because of it and it absolutely did make things harder with the opposition." At the core of the growing gulf between Turkey and the United States was the Obama Administration's decision not to actively topple the Assad regime. America failed to enforce its "red line" after Assad attacked his own people with chemical weapons on August 21, 2103, in the town of Ghouta. The Turks have since argued that the lack of U.S. intervention in Syria, and the fact that Washington has not sufficiently supported the moderate rebel factions, has allowed Assad to consolidate power in Syria. It can also be argued that this, coupled with American inaction after Ghouta, prompted the Turks (along with many other Sunni actors across the region) to arrive at the conclusion that they had little choice but to take matters into their own hands. But Turkey may have also leveraged the Syria crisis to undermine the Kurdish PYD, the Syrian affiliate of the PKK. Indeed, some Kurdish factions allege that Turkey has backed jihadi factions not only because it seeks the demise of Assad, but also because these groups are fighting Turkey's Kurdish foe. The PYD has charged repeatedly that Turkish border guards allow groups of radical fighters to cross into Syria to specifically fight Kurdish brigades. After JN and FSA units attacked Syrian Kurds in 2012, several witnesses said that it took place at the behest of Turkish security officials. Witnesses said that rebels were given assurances by the "Turkish military, which still sees the Kurds as enemies." Whether to bring down Assad or to challenge the Kurds, Turkey has undeniably allowed jihadists to take advantage of its lax border policies. This had made the Turkey-Syria border the jurisdiction of choice for Syria's jihadists to procure funds, smuggle weapons, and send fighters back and forth over the border. Though the Turks have turned away 830 foreign fighters from Europe and issued search warrants for 2,000 others in the last two years, many more have stayed and crossed into Syria. As the New York Times reported, even the businesses of eastern Turkey cater to these individuals. The Washington Post reports, that "among the baklava shops and kebab stands, locals talk of Islamist fighters openly stocking up on uniforms and the latest Samsung smartphones. Wounded jihadists from the Islamic State and the al-Nusra Front…were treated at Turkish hospitals." Juan C. Zarate and Thomas M. Sanderson further note that foreign fighters from Europe and North Africa can purchase passports for up to $8,000 near Kilis, Turkey, just across from Syria's Bab al-Salam border crossing, and within sight of Turkish border guards. Multiple reports have additionally shed light on how Turkey allows its border to be exploited. In some cases, Turkish authorities are simply not halting the border traffic. As one Turkish citizen told Newsweek, "the police are doing nothing." But in many cases, it appears that Turkish authorities may be actively assisting the jihadists. The PYD, for example, alleges that Turkish ambulances near the border have picked up wounded JN fighters for treatment in Turkish hospitals. Turkish opposition figures from Hatay province allege that Turkish authorities transported Islamist fighters to frontier villages and let fighter-filled planes land at Hatay airport. Mehmet Ali Ediboğlu, a CHP lawmaker from Antakya, told the Wall Street Journal that he personally followed a convoy of more than 50 buses carrying radical fighters to the border village of Güveçci, adding that a convoy of 10 police vehicles accompanied the buses. But the problem did not stop with personnel. Weapons have been streaming across the Turkish border, too. Reuters reported in July 2012 that Turkey set up a secret base with Saudi Arabia and Qatar to direct military and communications equipment to Syria's rebels from a city near the border. "Turkey is the main coordinator/facilitator," one source told Reuters. Washington not only knew of this base, it was collaborating with Turkey and Saudi Arabia. But it's unclear how many others like it were operating. Multiple accounts from AKP opponents suggest that Turkey-supplied weapons went to jihadi groups operating along the Turkish border, including JN. On September 8, 2013, Abdullatif Şener, a former AKP deputy prime minister, told the Iranian press that the Turkish government "sent a large volume of heavy weapons to the terrorist group, the Nusra Front." In September 2014, Ayla Akat Ata, a Kurdish deputy in Parliament, said that she received reports that "arms supplies … crossed the border from Turkey into Syria by train." It has been easy for Ankara to dismiss the Kurds, the Iranian press, and Erdoğan's detractors as politically driven when these reports emerged. But it has become more difficult as these reports continue to surface, and from a variety of sources. Meanwhile, multiple reports suggest that extremist financiers may be operating on Turkish soil, with the goal of bankrolling groups like JN and IS, among others. The financial facilitators hail primarily from Gulf countries, notably Qatar and Kuwait, and meet with radical groups in Turkey and support their efforts. One financial network of Kuwaiti donors was described by the Treasury Department in an October 2012 designation. The Treasury noted that funds were transferred to jihadists through intermediaries in Turkey. A Human Rights Watch report from October 2013 also cited several sources asserting that many foreign fighters in Syria were smuggling money through Turkey. In a visit to the U.S. in September 2013, Iraqi National Security Adviser Faleh al-Fayyad explicitly warned that armed groups and financiers from Qatar and other Arab nations were meeting in Turkish hotels and facilitating money transfers. Western analysts, such as Barak Barfi from the New America Foundation, personally witnessed some of this activity. "Jihadists have safe houses in border towns [and provinces] such as Antakya, Gaziantep, Kilis and Reyhanlı, where they meet Persian Gulf funders and coordinate logistical aid deliveries," he told the Foundation for Defense of Democracies in February 2014. In April 2013, Abu Bakr Al-Baghdadi announced the creation of a new jihadi group: The Islamic State in Iraq and Levant (ISIL, also known as Islamic State in Iraq and al-Sham or ISIS). The group, which sought to create a caliphate in Syria, Iraq, Lebanon, and Jordan, was forged out of former fighters from al-Qaeda in Iraq, a group rolled back by U.S. forces over the previous decade, but that reemerged as the Syrian civil war took shape. The group included jihadists that Assad released from jail after the uprising began, but also included remnants from the Saddam Hussein regime and Sunni tribal elements in Iraq. Early on, ISIL and other jihadists joined forces against Assad's army. They were united in common cause, particularly as the Syrian strongman carried out atrocities against his political opponents across the country. But by February 2014, it became apparent that ISIL was unwilling to take orders from al-Qaeda. In some ways, ISIL was even too extreme for elements within al-Qaeda. The notorious terror network responsible for the 9/11 attacks renounced its ties to ISIL after months of infighting. At first, Washington viewed ISIL as an insignificant threat. Famously, U.S. President Barack Obama in January 2014 likened the group to a junior varsity high school team. "If a jayvee team puts on Lakers uniforms that doesn't make them Kobe Bryant," Obama said. But, by the spring of 2014, ISIL was making significant gains. In May, the group kidnapped more than 100 Kurdish students from Northern Syria. In June, the group captured the Iraqi towns of Mosul, Tikrit, and Qaim. ISIL also raided Iraqi prisons, freeing 1,500 prisoners in Mosul and 300 in Tikrit. After consolidating territory in both Iraq and Syria, the group declared a caliphate, changed its name to the "Islamic State" (IS), and proclaimed al-Baghdadi as leader of world's Muslim community. The Islamic State continued to roll. In July, the FSA announced that all cities between Deir Ezzor and the Iraqi border had fallen to IS. The following month, IS captured Syria's largest oil field, which can produce 75,000 barrels of oil per day. IS then went on to capture a weapons depot near Baghdad and an Iraqi gas field. Indeed, IS was accumulating significant financial and military assets. And in a move reminiscent of the Taliban's destruction of the Bamiyan Buddhist statues in March 2001, the group blew up Jonah's tomb in Mosul, sparking outrage worldwide. In August, as IS besieged the Iraqi Kurdish town of Sinjar, President Obama ordered airstrikes against the group. U.S. F/A-18 jet fighters also bombed artillery sites in Northern Iraq and helped retake Mosul Dam. In response, IS released videos showing the beheadings of two American journalists held by the group: James Foley and Steven Sotloff. By September, the CIA estimated that IS boasted more than 3,000 fighters across Iraq and Syria. The movement continued to capture territory in northern Syria at an alarming rate. In response, the U.S. stepped up its air strikes against IS, including its "capital" in Raqqa. As IS marched across Iraq and Syria, reports suggested that extremists were still exploiting Turkey's borders. In June 2014, for example, Western aid workers reported the presence of jihadists at the humanitarian crossing near the Syrian village of Atma. And the crossings worked both ways. One German news report recounted that two Turkish IS fighters crossed back into Turkey without incident after telling a soldier that "they had just returned from the battle to conquer Mosul and were heading to Istanbul for a bit of relaxation." It was not clear whether the fighters were aligned with IS or other groups. Meanwhile, multiple reports suggests that IS was recruiting Turkish fighters inside Turkey. Newsweek reports that poor and conservative neighborhoods in Turkey, such as Dilovası in Ankara, are particularly susceptible. The Turkish daily Hürriyet also traced IS activities in other Turkish cities, including Gaziantep, Şanlıurfa, Kocaeli, Diyarbakır, and Istanbul. The anti-AKP and Kemalist newspaper, Aydınlık, reported in September that IS militants were operating in Konya, Gaziantep, and Hatay. One Turkish security official told the paper, "Militants operate either in police or gendarmerie areas. It is not possible that their operations are not within their knowledge. There are no official numbers for Turks who have joined the fight in Syria. One estimate puts the number of Turks at 600-700. Another puts the number at 1,000. Along with ideological affinity, financial inducements have played a role in Turkish recruitment. As The New York Times reported, IS offers $150 a day to Turkish recruits who agree to fight. But whatever foothold IS has established inside Turkey, the border with Syria remains its most vital asset. The oil fields IS conquered have become a significant source of revenue. Journalist Mike Giglio of BuzzFeed notes that, "with sky-high domestic fuel prices, [Turkey] has been a key market for the oil that funds ISIS." In a lengthy exposé, Giglio documented the way the smuggling works. In short, after the oil is extracted in Syria, middlemen bring it to the Syrian border, where it is pumped into pipes buried underground. As one smuggler noted, the Turkish border guards, "close their eyes." Much of the oil is sold locally in Syria, although anywhere between $1 and $2 million worth of oil has been smuggled daily to bordering territories. Some of the oil is sold in Iran or Iraq's Kurdistan Regional Government (KRG), but the majority is sold at points along Turkey's border, where smuggling activity has historically been very high. According to Hussain Allawi of the Iraq Energy Institute, IS smuggles about 210 oil tank trucks into "Turkey and other places every day." As Turkish parliamentarian Ali Ediboğlu from the CHP opposition party noted in June 2014, "$800 million worth of oil that ISIS obtained from regions it occupied this year is being sold in Turkey … They transfer the oil to Turkey and parlay it into cash." The Turkish town of Hacıpaşa is one area of particular concern. This town on the Orontes River at the Turkish-Syrian border has developed a sophisticated system, allowing the locals to cash in, more so than in other bordering towns. As the Associated Press reported, "the pipelines were up to three kilometers long and laid up to 15 meters deep, dug using sophisticated imported vehicles with equipment designed to lay fiber-optic cables that cost hundreds of thousands of dollars each … The diesel, crudely refined in Syria, emerged from spigots in cotton fields in Hacıpaşa and nearby towns, where eager buyers lined up." "Some people multiplied their wealth a thousand fold in a few months," a Turkish gas station owner noted. Another woman noted that she earned 20 times her waitress salary by smuggling. "Once a week she would coordinate oil runs, sitting next to the driver on 10-hour truck trips from Hacıpaşa with thousands of liters of diesel to a company in the Anatolian city of Denizli, earning $6,500 a trip," Associated Press reported. As the crisis deepened with IS in the fall of 2014, oil smuggling became a clear point of friction between Ankara and the West. However, the U.S. has elected not to challenge Turkey openly about the problem. Rather, White House press secretary Josh Earnest put a positive spin on it. "Turkey can also play a role in cracking down on oil smuggling," he said. "As you know, the sale of oil in the black market has been an important way that ISIL has financed their operations … So shutting down oil smuggling is a key component of our strategy to shut off the supply of financing to ISIL for their operations." Meanwhile, there has been minimal attention placed on the problem of antiquities smuggling from Syria through Turkey. As Amr al-Azm, Salam al-Kuntar, and Brian I. Daniels noted in The New York Times, "ISIS seems to be encouraging the clandestine export of archaeological finds, which is primarily centered on the border crossing from Syria into Turkey near Tel Abyad, an ISIS stronghold." Turkey-based journalist Mike Giglio notes that he has received, "credible accounts from multiple sources about [antiquities smuggling]." And as Mark V. Vlasic notes, "Just as 'blood diamonds' helped fund slaughters in Africa, 'blood antiquities' are helping to finance terrorism in the Middle East." Exactly how much money ISIS makes on antiquities smuggling, and how much of its crosses Turkey's border, is not known. Turkey is undeniably feeling the negative effects from the rise of IS. European and U.S. pressure is part of the equation. Senior White House officials have increasingly voiced their displeasure in high level meetings over the last year. But Turkey is also feeling pressures close to home. In March, for example, IS captured a small Turkish enclave protected by a small contingent of Turkish troops in northern Syria, the tomb of Süleyman Şah. The tomb lies 15 miles outside of Turkey's border, but is officially considered Turkish territory under the 1921 agreement with France. Leaked recordings revealed that senior Turkish officials were increasingly concerned about the security threat that IS posed, with particular agitation about the tomb. There is also no question that, in addition to the large numbers of Turks who have gone to fight alongside IS, Turkey is home to many IS sympathizers. Ali Ediboğlu, a Turkish opposition deputy, claims that "at least 1,000 Turkish nationals are helping … foreign fighters sneak into Syria and Iraq to join ISIS." Youtube videos depict IS gatherings in Istanbul and demonstrations of support by Turkish citizens for the jihadi fighters in Syria, including IS. On September 26, for example, it was reported that some 20 people with black masks on their faces and bats in their hands attacked an Istanbul University demonstration against IS. The group, identified in the article as "Müslüman Gençler" (Muslim Youth), reportedly returned to campus for more attacks. Turkey-based journalist Mike Giglio further notes his concern about the "level of ISIS support among the 1-million-plus Syrians living in Turkey. I don't see how they can successfully weed out ISIS supporters from among these refugees." The domestic presence of IS and other jihadists in Turkey suggests that the country could be susceptible to attacks in the future. This is not lost on Ankara. Reportedly, U.S. government officials will no longer stay overnight in the southeastern towns of Urfa and Gaziantep because of the threat of radical groups targeting Westerners. And the threat could extend to Turks, as well. On May 11, 2013, two car bombs exploded in the Reyhanlı district of Hatay, leaving 50 people dead. Although the government blamed the Assad regime for the attack, some later charged that JN was responsible. The attack not only suggested that Turkey could descend into political turmoil. It also raised questions about potential economic turmoil. As one political scientist noted, "Tourism is one of the most important economic sectors. If a bomb goes off in a hotel and a couple of vacationers die, it's over." Turkey's tourism sector accounted for $23.4 billion in 2012, roughly 3 percent of the $800 billion GDP that year. The Turkish economy is also highly dependent on foreign investment and is therefore sensitive to external developments and security challenges. Foreign direct investment in Turkey exceeded $130 billion as of December 2012. Turkey is also highly dependent on short-term foreign capital; about 80 percent of the $60 billion current account deficit is financed by so-called "hot money." The Syria crisis has also exacerbated the domestic battle between the Gülen movement and the AKP. After years of cooperation, exiled cleric Fethullah Gülen, from his home in Pennsylvania, broke with ruling party last year, primarily over disagreements revolving around the AKP's Kurdish and foreign policies. The domestic power struggle has been a bruising battle; Gülenists have leaked embarrassing details of corruption and illicit finance on the part of Turkey's top leaders. The Gülenist media has also hammered the AKP with a relentless stream of damaging news items, including some that shed additional light on Turkey's dangerous border policies. Meanwhile, Turkey's intelligence services, border protection, law enforcement agencies, and other domestic services have been drawn into this battle, and they are often at odds with one another based on their allegiances. This has further complicated Turkey's ability to control its border with Syria, not to mention the activities in the border towns. Finally, the challenge of IS has placed great strain on Ankara's sensitive and complex negotiations with the PKK. The talks began in early 2013, and Turkey hoped to bring an end to the decades of distrust and violence with the Kurdish population. At first, the Syrian civil war had little impact on the peace talks. But this dramatically changed with the emergence of IS. The jihadist group not only targeted the Assad regime. It struck at Kurdish groups, too. Some Kurds believe that Ankara is tacitly or even actively promoting this strategy. In September 2014, when IS reached the limits of the Syrian Kurdish town of Kobani, Turkish-Kurds rioted across Turkey. Though this was mainly out of protest over Turkey's inaction to save Kobani from IS (the Turkish military literally watched the onslaught from across the border), it also reinforced the strong belief among Kurds that Turkey deliberately assisted the jihadists besieging the Kurdish town. Turkish Kurds openly declared that the attack and possible fall of Kobani would be considered an assault on them. Abdullah Öcalan, the jailed leader of the PKK, went as far as to declare that should Kobani fall, the peace talks would be terminated. In late October, Turkey began to allow select Kurdish fighters across the border to fight against IS in Kobani, staving off the Islamic State, at least for a while. However, tensions continue to simmer beneath the surface as Kurdish factions seek to leverage the Syrian civil war to advance their nationalist cause and undermine Ankara in the process. These complicating factors did not, however, convince Turkey to join the U.S.-led anti-IS coalition. Forged in August 2014, the coalition includes Qatar, UAE, Jordan, and other Middle Eastern allies. Turkey's absence, as a NATO ally, was conspicuous. To its credit, the Turkish Parliament passed an October 2 motion granting the government the authority to send the Turkish military into Iraq and Syria, should it be necessary for Turkey's national security. This authorization also included the possibility of allowing foreign military personnel to operate in Turkey. However, it remained unclear what role, if any, the Turkish military could play in the anti-IS coalition. It was even less clear what Turkey was doing to address the border problems that contributed significantly to the crisis. One possible constraint for Turkey was IS's June kidnapping of 49 Turkish citizens from the Turkish consulate in Mosul, Iraq. The kidnapping was one of the most serious attacks in modern Turkish history. So long as the hostages were in IS hands, Ankara was concerned that any alliance with the West would put their lives in danger. The hostages were finally freed on September 20, 2014, after more than three months in captivity. The Turkish National Intelligence Organization (MIT) maintained that it "obtained the release of the hostages in a covert operation," but did not specify how this operation was achieved. However, it soon was reported that Turkey directly negotiated a swap for the hostages: 180 jihadists for the release of 49 hostages. Some of the jihadists released were reportedly from the U.K. and the EU. It was unclear whether any of this was coordinated with Washington. As Ben Rhodes, Obama's deputy national security adviser for strategic communications, stated, "We don't have specifics on the Turkish agreement... We know they were in very active efforts to secure the release of those hostages for some time. What I will say is now that those hostages have been released, we would like to see Turkey play an active role with our coalition in taking the fight to ISIL." Questions lingered about whether Turkey has established a modus vivendi with IS that it sought to preserve. As a former senior U.S. official observed, "There are no hostilities between the Islamic State and the Turks. And you can even go so far and say, one some level, there is a channel of communication… I think the Turks want to maintain that no-hostility. It's a conscious decision… It could be for reasons of blowback." In other words, if Ankara joins the coalition, it could soon find that the IS operatives on the Syrian border and within Turkish territory could attack the Turkish state. This is, of course, a problem of Turkey's own making. But it might go a long way to explain Ankara's approach. Other questions about Turkish collusion also remain. For example, one former IS fighter interviewed by Newsweek said that he, "travelled in a convoy of trucks as part of an [IS] unit from their stronghold in Raqqa, across [the] Turkish border, through Turkey and then back across the border to attack Syrian Kurds in the city of Serekaniye in northern Syria in February." IS commanders reportedly told the fighters that "there was full cooperation with the Turks," and that one commander "frequently talked on the radio in Turkish." It is difficult to ascertain the veracity of such reports, particularly when the source is avowedly anti-Turkish. And such stories are somewhat harder to reconcile with the fact that Turkey has allowed the U.S. to operate unarmed drones (Predators) from İncirlik to perform intelligence, surveillance, and reconnaissance missions over Syria. Turkey further agreed to support the revived effort to train and equip moderate opposition groups in Syria. The U.S. and other NATO allies have been permitted to use Turkish bases for other logistical and humanitarian purposes, too. But Turkey has yet to agree to allow the U.S. or any other coalition partner to use Turkish air bases to launch attacks on ISIS in Iraq or Syria, or to use Turkish airspace. Turkey insists that, in order for this to happen, the coalition must broaden its goals to imposing a no-fly zone over parts of Syria to counter Assad's air force and to create a security zone in northern Syria. The White House, for its part, has played down Turkey's reticence to help. As Rhodes stated, "we don't need the Turkish bases. We have plenty of resources in the region, [including] aircraft carriers, [and] other military assets that are prepositioned in the region." But the war in Syria has undeniably driven a discernible wedge between Washington and Ankara. Turkish intransigence has even prompted a debate as to whether Turkey is a reliable NATO partner. For now, the big issue for Washington is the flow of fighters, weapons, cash, and other material to Syria. This problem has been raised repeatedly at the highest levels, including a September meeting between Davutoğlu and Secretary of State John Kerry. In response, Turkey temporarily shut part of its border after fighting erupted between moderate Syrian rebels and IS. Josh Earnest, a White House spokesman, implied in late September that cooperation was deepening. "We want to make sure they're working with us to lock down that border as best they can … to apprehend people who we believe have been engaged in extremism," he said. Turkish authorities have responded further by cracking down on some oil smuggling operations and other illicit trade, according to reports. In October 2014, Ankara claimed to have increased border controls, arrested dozens of smugglers, and conducted extensive stop-and-search operations on Turkish highways where fuel tanks were tested for smuggled oil. Police in Hatay said that they have been arresting smugglers since early 2014, with 38 arrests between June and October 2014 and $5.7 million in fines. According to Hatay's governor, officials added 783 personnel to work in 56 locations around the province, around the clock. Turkish journalist Fehim Taştekin estimates that the crackdown has decreased smuggling significantly, but thinks the activity continues and authorities could still be more aggressive. Troubling questions remain about the role that Turkey is willing to play in restoring order to Syria. President Erdoğan has lashed out at the West for pushing Turkey to do more against IS. Famously, the Turkish leader angrily compared the outside influence of Westerners to the role of T.E. Lawrence, the renowned British army officer during the Arab Revolt against the Ottomans during World War I. But wild rhetoric aside, there is a fundamental issue that hangs in the balance. Despite its status as a NATO ally and long-time U.S. ally, Turkey's interests are no longer squared with those of the West—particularly when it comes to Syria. Ankara will rightly point out that its border policy is not entirely geared around the flow of fighters, weapons, and cash. Turkey opened its border to allow for some 1.5 million Syrians to take refuge in the country, giving them shelter, food, and medical care. The Turkish government also insists that the highest priority is bringing down the regime of Bashar al-Assad. And while the White House has elected not to embrace this position, it cannot be dismissed. The Assad regime has slaughtered untold thousands of Syrians since the war began. Long before that, Syria was a state sponsor of terrorism that supported groups like Hezbollah, Hamas, and other violent factions that attacked American forces in Iraq. Assad has undeniably dragged the region into crisis, and America's Syria policy has taken a horrible situation and made it worse, but Turkey has contributed significantly to the extremism problem that is now spreading across Syria and Iraq. Turkey won't quite acknowledge this, but it does appear to be wrestling with its next moves. Washington now has little choice but to engage with Ankara, to ensure that Turkey's southeastern frontier ceases to serve as a jurisdiction for weapons smuggling, bulk cash smuggling, illegal oil sales, and the flow of fighters, to name a few. Diplomacy will certainly continue to play a role, as diplomats work to coax Ankara into adopting policies that preclude working with extremist groups—even those that have yet to be designated. But for these discussions to have an impact, they must take place at the highest levels. As one former senior U.S. official noted, President Barack Obama "has to talk to Erdoğan. And this is not a phone call. This has to be discussed seriously. [Director of Central Intelligence] John Brennan needs to be talking to [MIT chief] Hakan Fidan." These discussions must also address ways to better support the moderate opposition groups in their fight against the Assad regime. This will be the only way to get the Turks on board. Washington also has an opportunity to help Ankara stand up a comprehensive and integrated border defense system. "This is not about sharing names," the former official notes. "This is about controlling the border… it's about identifying networks." Doing so could be costly and require significant manpower, but the US could coordinate with other NATO allies to defray the costs and human resource requirements. If these approaches fail, Washington may need to consider tougher measures, including sanctions against Turkish nationals or entities that facilitate the flow of cash, fighters, and other materiel across the Syrian border. This could place significant strain on U.S.-Turkish ties, but such measures may be necessary if Ankara fails to cooperate. Washington may also need to threaten the cessation of military or intelligence cooperation if the right results are not reached. Turkey must now understand that while America's Syria policy may have been feckless, its border policy has been reckless. By contributing to the rise of JN, IS, and other dangerous groups, Turkey has greatly exacerbated the Syria crisis. Some might even argue that Turkey could now qualify as a State Sponsor of Terrorism for abetting JN and IS. For now, such discussions are barely raised above a whisper in Washington. But that may not remain the case if Washington is not able to convince Ankara—and to work with it—to correct its mistakes.
. Interview with former senior U.S. government official, November 7, 2014, Washington, DC.
. "Jabhat al-Nusra," Jane's World Insurgency and Terrorism, October 2, 2013, page 15.
. Thomas Joscelyn, "Statement from Zawahiri's Representative Shows Syrian Rebel Group Tied to al Qaeda," The Long War Journal, January 18, 2014; (http://www.longwarjournal.org/archives/2014/01/statement_from_zawah.php) & "Harakat Ahrar al-Sham al-Islamiyya," Jane's World Insurgency and Terrorism, October 2, 2013, page 19.
. Email correspondence with Mike Giglio, November 12, 2014.
. "IŞİD Canilerinin Destekçileri Üniversitede Yine Terör Estirdi," Cumhuriyet (Turkey), September 29, 2014.
. Kemal Kirisci, "Turkey's ISIL Dilemma: To Fight or Not to Fight," Brookings Institution, October 7, 2014. (http://www.brookings.edu/blogs/up-front/posts/2014/10/03-Turkey-isil-dilemma-kirisci?utm_source=Twitter&utm_medium=Social&utm_campaign=BrookingsInst10061&utm_content=BrookingsInst10061). This motion did not mention IS by name.